Mostly treatments to correct those problems are surgical. But surgery is very expensive with long downtime. The chosen laser is a 10 watts diode laser , which is easy and safe. Such laser is used with 400 microns optical fiber, pulsed mode at 8 watts. This is the reason why I called it “laser threads”. 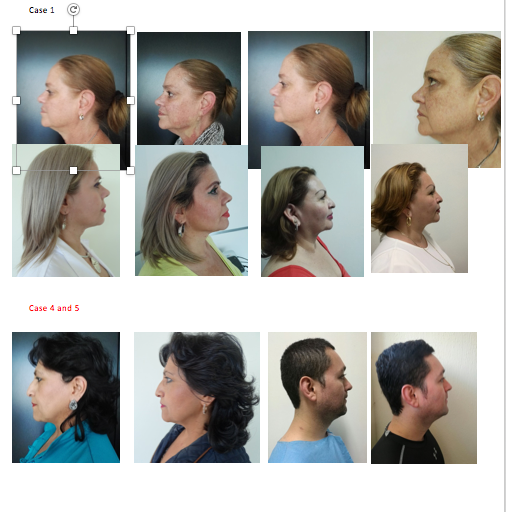 Objective: The main objective is to demonstrate a tensor effect with the use of the diode laser in the lower face. Then to compare the formation of new collagen using laser threads vs the traditional technique of pdo threads. ( where many authors demonstrated pdo never lead to neocollagenesis). Choice of patients included, men and women older than 35 years, which showed a flaccidity of the lower third of face. Without biopsies. Total of the patients: 7 women and 2 men. Using only one session. Marked the vectors in the lower face like the traditional threads, firing in pulsed mode the laser by means of an optical fiber. Prior placement of anesthesia in the thread path. The fiber is placed helped by means of a needle 18 G x 1 inch. Then a pressure bandage is placed for 3 days in the treated area . Conclusions: All patients shown satisfaction with the results; two of them complained of mild pain after the procedure, all of them recommended the procedure. The laser diode procedures lead to a lifting effect, producing new collagen. . (We are still waiting the results of biopsies to compare the neocollagenesis produced by laserthreads vs PDo threads ).